JIPMER 2017: JIPMER MBBS exam will be held on June and July, 2017 to fill 200 undergraduate seats. JIPMER 2017: There will be a total of 200 Multiple Choice Questions (MCQs). JIPMER 2017: Jawaharlal Institute of Postgraduate Medical Education and Research, Puducherry (JIPMER) has released the admit cards for the MBBS entrace examination 2017. 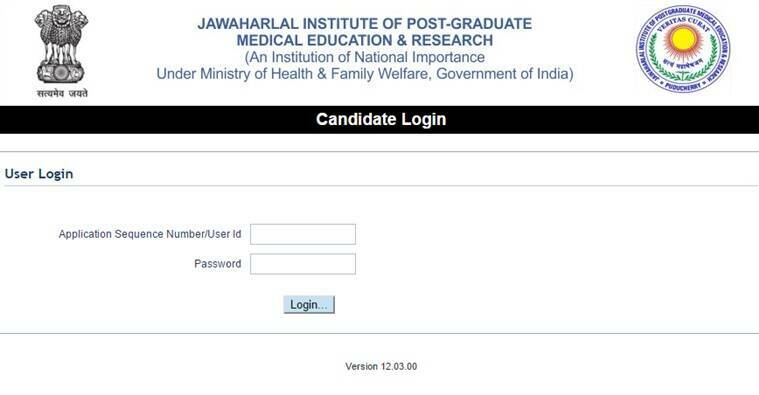 Candidates who have applied for the exam can download their admit card from the official website. JIPMER MBBS exam will be held on June and July, 2017 to fill 200 undergraduate seats at JIPMER Puducherry and Jipmer Karaikal. The theory exams for JIPMER Puducherry will be held from June 5 to June 16 and the practicals will take place on July 3 and 5. For JIPMER Karaikal, the theory papers will be held from June 5 to June 16 and the practicals will be conducted from June 28 to July 5, 2017. The duration of the exam is two-and-a-half hour. The online exam will be conducted in two shifts. The first shift will be from 10 am to 12.30 pm while the afternoon shift will be held from 3 pm to 5.30 pm. There will be a total of 200 Multiple Choice Questions (MCQs) with 60 questions each in Physics, Chemistry and Biology. The English, Logical Reasoning and Quantitative Aptitude sections will contain 10 questions. JIPMER 2017: Enter your details in the fields provided. – Go to the offcial website for JIPMER (jipmer.edu.in). – Click on the notification “Download Hall Ticket for JIPMER MBBS Entrance Examination – 2017”. – Download the hall ticket and take a print out for further reference.